... are indeed one and the same. 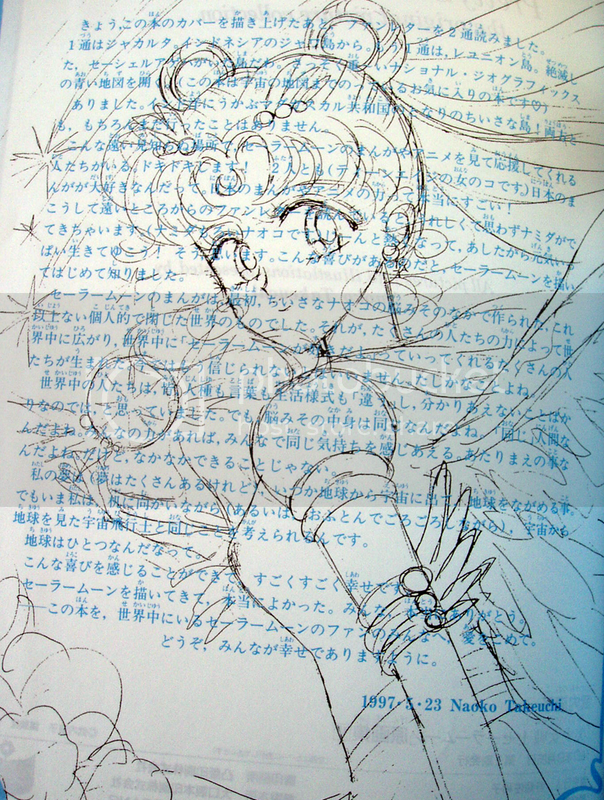 These images were taken from Artbook #5, the very last page, where Naoko does her "thank you's" to the fans for purchasing the book. Aside from this, if you go to The Oracle, the translations of one of the paintings states that Naoko had intended for a picture of Eternal Sailor Moon and Sailor Cosmos to be layered, one over the other, but the picture of Cosmos didn't show up properly. On top of all that, the translation of the last few pages from the Final Arc, where Cosmos is talking to the Sailor Quartet is taken a bit too literally. "Sailor Cosmos!?" says Ceres. "It can't be... It can't be... Are you the future... The future Sailor Moon's ultimate form!?" "I am only a coward," the woman says. "I abandoned everything, and ran away from where I should have been. 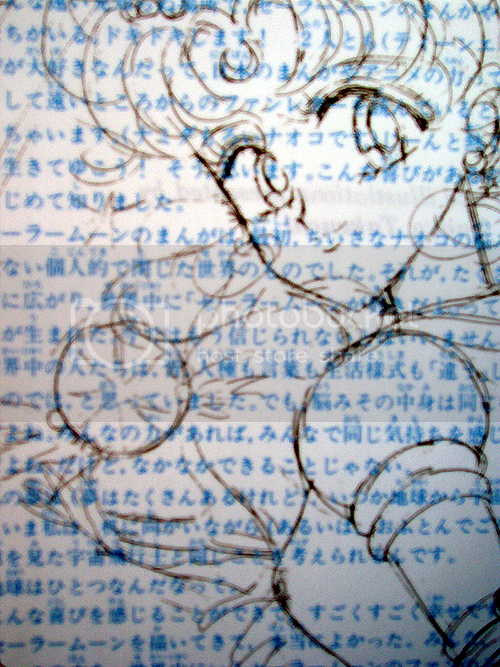 Eternally, I am no match for the final courage and strength of Eternal Sailor Moon." "Final courage!? Then, is Sailor Moon-!? She can't be..."
She never says that she is NOT Sailor Moon, or one of her forms, she simply states that in this current form, that she is no where near the level of strength of Eternal Sailor Moon, which doesn't necessarily imply that she is not her from the future. "The me of here, too, was all alone. Always suffering. So I was always by her side, to support her. I was going to make her choose the right path this time.... But I knew. The chosen path was not a mistake. Nobody can destroy the place where stars are born. Because of this place, we can continue living. Time and time again, we can start over. I won't run away anymore. I'll go ahead to the future. Because I was blessed with great power by Eternal Sailor Moon. All the courage and strength to stand alone, the courage and strength to accept everything! I had forgotten it. The matchless strength!" She is saying here that she cannot be the person she was before, in terms of courage, strength and bravery. They are the same person, but Sailor Cosmos cannot be the same as she was before because of the effects of the war with Sailor Chaos. She doesn't have the same level of sacrifice in her that her former self did, and she had come back from the future to destroy The Galaxy Cauldron so that her terrible future would never happen. So, what it comes down to, is that Sailor Cosmos is referring to the emotional strength that Eternal Sailor Moon has, the ability to sacrifice everything to save her friends and her future, where Cosmos does not possess that level of maturity from the future and chooses to come back to destroy in the past what will ruin her future. I always assumed she was either a. a higher enlightened form (like energy?) of Usagi in the future.. like- a transcendance of physical to something more or b. some raw form of Usagi's power... that looks exactly like her? The funny thing is, the japanese never really seem to give a solid answer to a lot of stories/movies. And I wasn't the one who noticed this, it was my Kendo Sensei that told us. I had seen Zatoichi and had been completely confused by the ending. When I brought it up during a Kendo get together, Sensei informed me that almost all TV, Movie and books written are like that. He found that whenever he went to see a movie with his wife, and he couldn't figure out the ending, she almost never could either and was just fine with that. He said he thinks it has something to do with the producers and directors wanting to give you something to think about, maybe even to build your own ending. Part of me thinks that Naoko tried to do that here as well, seeing as there isn't a concrete timeline in the story for anything past Usagi and Mamoru's wedding. For example, we see the construction of Crystal Tokyo taking place in the last Arc, but she allegedly was not made Queen until some 2000 years later. Why would you build a palace that you couldn't use for 2 milennia? Imagine the dust! On top of that, if she hadn't yet awakened the world from the sleep that they had been put in, how did anyone know that she was going to be Queen 2000 years in the future? Divine Inspiriation? Or were they just building a huge glass office tower when everyone went to sleep for a few thousand years? This page was loaded Apr 26th 2019, 9:49 am GMT.